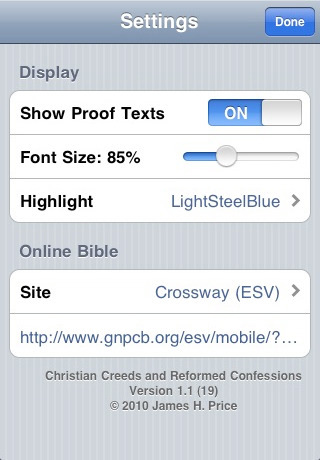 Christian Creeds and Reformed Confessions [iTunes link] is a free iPhone app put out by Westminster Seminary California. Its content includes: The Apostles', Nicence, and Athanasian Creeds; The Belgic Confession, the Heidelberg Catechism, the Canons of Dordt, the Westminster Confession, and the Westminster Larger and Shorter Catechisms. The app is very easy to use and has a couple of really nice features. First, the search feature is great. 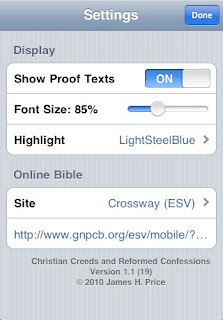 Searching for any term, such as "faith" returns every instance of the word "faith" as expected; however, you can also use certain keywords such as NEAR to modify your search. 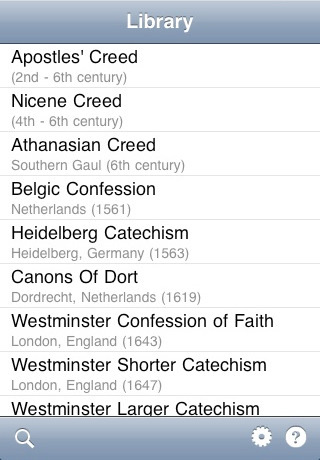 For example, if you search for "faith NEAR justification" the app will give you every instance where the word "faith" is with 10 words of the word "justification" in any of the creeds, confessions or catechisms. There is one serious problem I have with this app. 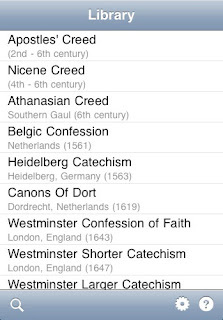 That is, although in the table of contents it lists "Westminster Confession of Faith, London, England (1647)" it, in fact, does not contain the original version of the Confession. It is the American version of the Westminster Confession, more specifically, the version adopted by the OPC. I want to be clear that my issue is not so much with the American version (although I prefer the original), as much as it is with the fact that the table of contents claims something that is not true. This error needs to be corrected. Overall, this is a very helpful app and I find myself using it on a regular basis. 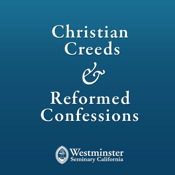 Westminster Seminary California is to be commended for making this available to us all for free.